Which water conditions did you have in mind for the K4 speedfin design? The speed fin was originally Farrels idea, to combine all of our knowledge to make the ultimate speed fin. We were looking for a fin to basically get us over 50knots when the perfect day arrived. We are lucky in that we have West Kirby on our doorstep -a man made lake on the Wirrel coast, exposed to Westerlies which funnel across the top of Wales, also often giving the optimum angle and of course with very flat water. Although it can be mirror flat in the top corner, we still get some rolling chop towards the end of the course to deal with when the angle is perfect, but we didn't set out to make any concessions to control in the chop! It was never a commercial venture, we just did it because we wanted to go faster. 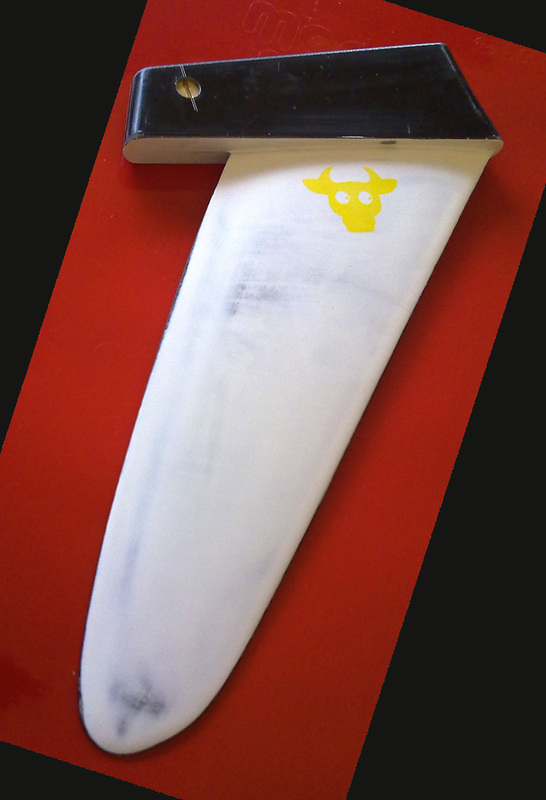 Is the K4 speedfin also quite flexible like the unique wavefins K4 fins? Why did you chose hard or soft stiffness? We basically set out to make the fin as thin as possible, whilst still being stiff enough to perform with the huge loads going through it. A tight carbon layup with accurately cut sheets was the best way to achieve this. In the past I've made aluminium fins which I haven't been able to bend in the vice, but which have become permanently bent whilst sailing! There's heck of a lot of force going through the fin when a speed sailor loaded with a weight jacket are levering against it. We actually made two previous prototypes in order to get the stiffness and flex correct; the first was slightly too flexy, the second slightly too stiff, we nailed it on the third one. We knew before we'd even sailed it! 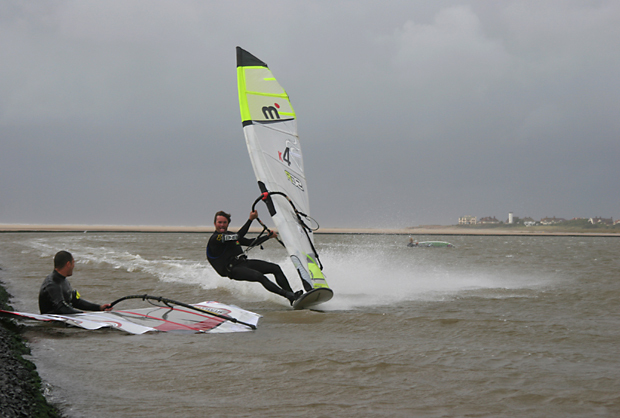 It did 48 knots in the hands of Farrel and myself on it's first and only outing so far. Why is the profile asymetric? As luck would have it both of the really fast courses in the UK only really fire up on Starboard tack (right hand forward at Southend and West Kirby), so an asymetric foil was the obvious choice. Asymetric foils are more efficient on their designed tack, in the same way that an airplane wing works best the right way up. Again this allows us to go slightly thinner as we still have the desired camber on the upwind side, whilst being flatter on the downwind side. 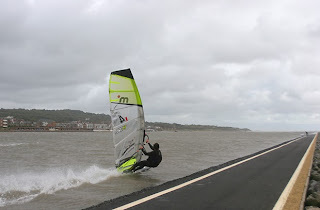 The fin still works sufficiently well to get you home on the wrong tack. I read about 20cm long, is this the size recommended for most speedboards? Yes, for ideal conditions on most speed boards (ie. 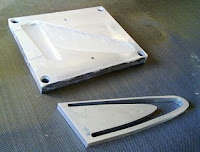 40-50 cm wide) a modern 20 cm fin is perfect. Of course there's a lot more to it than just the length; area, profile and foil also play a large part. 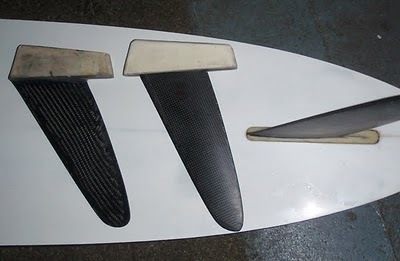 In general fins are getting a greater area and the foils producing more power for a given length. I've had some great speeds out of an old g10 21cm, which actually has a great deal less area and power than the more modern fins but has a tendency to 'let go' when pushed really hard. Our 20 cm is rock solid even in the most extreme gusts and when running through the end of course chop. Farrel and myself are at opposite ends of the weight spectrum and it worked well for both of us, so our next prototype will be considerably smaller. Still aiming for absolute minimum drag and ultimate top speed, with no concession to control or power as we seem to be achieving those regardless.